Sedona Cake Couture had the honor of creating this 5'2" tall wedding cake for the reception of Rebecca Jean Francis and Keith Richard Galbut on Saturday, April 25th. With over 1000 sugar flowers between the seven tiers it was our tallest and most elaborate cake to date. The Catering manager of the Ritz Carlton called it a Rock Star Cake! Carefully transported in pieces from Sedona, the wedding cake was assembeled on site at the groom's parent's home in Paradise Valley. Thank you Becky and Keith for the opportunity to create this incredible cake and for including us in your joyous marriage. We wish you the best! What can one say, but simply stunning! Good Lord!!! This is the eighth wonder of the world. The most gorgeous, spectacular cake in the solar system! 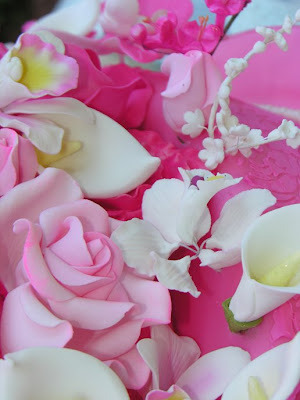 Also, I think the chocolate roses on the 'spring is here' cake are your best ever! On behalf of the bride and groom...it was the most spectular cake we have ever seen...or dreamed of!!! Andrea is a master! Her energy and emotion was conveyed into this amazing work of art! No only did it look beautiful but every last ounce was enjoyed by our guests. Thank you! I am simply amazed! This cake is huge and it must have taken forever to create! It's definitely an incredible work of art. I love stunning wedding cakes like this. 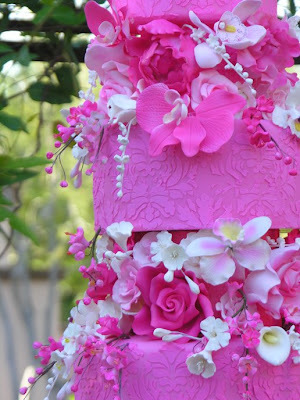 this cake is so giant and gorgeous! you did an incredible job. YOU MAKE THE BEST FLOWERS I HAVE EVER SEEN! 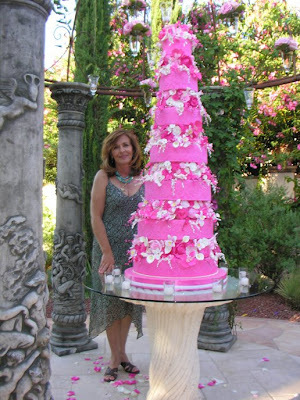 Sedona Cake Couture Creates Luxury in Cakes!